Flea markets, garage sales and estate sales are paradise for bargain hunters and collectors. While it is always exciting to find new treasures, pay careful attention to what you bring into your home. Items – especially books and fabrics – should be inspected carefully before introducing them into your home. When I was in college way back when, my roommates and I purchased a used couch for our apartment. We were excited about our new purchase. It wasn’t long before we discovered that our new couch was home to our newest roommate! A mouse was living in the inner workings of the couch. With some difficulty we eventually were able to evict our little guest. This sort of thing isn’t going to happen to you if you are a collector of tea cups or figurines. Book collectors, on the other hand, do need to take care. Old books can bring things into your home that are infectious to your existing collection. We will explore what to look for and remedies to ensure a healthy collection. 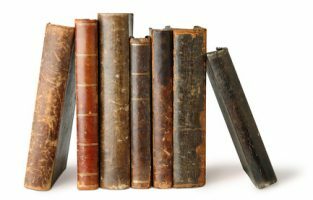 When you bring home old books to add to your collection, keep them separate from your existing collection until you can thoroughly inspect them. Put them on a clean surface away from your other books. When you are ready to begin work, make sure your hands are clean, and remove any food or drink from your work space. You may want to use cotton gloves while working with your collection. Carefully inspect each book for mold, mildew and insects. Examine the covers and the pages, and don’t forget to inspect gutters (inside margins) and inside the spines of your books. During this inspection it would be wise to wear a face mask. If there are mold spores, you don’t want to inhale them. Mold will appear as odd spots or stains, can be fuzzy or stringy, and comes in a variety of colors. Mildew is a type of mold that appears as flat, powdery splotches, light in color, turning dark over time. Insects that infest papers and books include silverfish, book lice, cockroaches, and beetles. These insects like to feed on the paper and page surfaces as well as the glue and bindings of the book. So be sure to do a thorough inspection, looking for live insects and insect carcasses as well as small holes, rough paper edges, stains, and small piles of dust or pellets. Nothing will completely eliminate mold and mildew. So the goal is to stop the growth of mold/mildew by returning it to a dormant state. When dormant, the mold spores still exist but will do little damage. One non-chemical method to do this is called controlled freezing. This involves wrapping each book in freezer paper or plastic, securely taping it shut and removing all air to prevent condensation from building up inside the wrapping. You want the materials to freeze quickly and thaw slowly, ideally freezing to -4°F (-20°C) within 8 hours for a duration of 48 to 72 hours. To thaw bring the temperature back to 32°F (0°C) over 8 hours and to room temperature within 24 hours. You may want to repeat the process to ensure effectiveness. The freezing process will kill insects and make dormant any mold and mildew. At this point, you’d be wise to move the books outside where you will unwrap them, and with a soft brush, gently remove residue from the covers, pages, and spine. This is not something you want to do in the house unless you have a fume hood and can seal off the room you are working in. Make sure you are wearing protective gear – face mask at a minimum. Congratulations! The mold is dormant and the bugs are dead. Now what? Take a look at the conditions in which you will store your newfound treasures. You need to control the environment where you are displaying your books. Recommended relative humidity is below 55% and temperature is 70°F (21°C) or less. Use a dehumidifier if necessary – but keep an eye on the levels because too dry could result in brittleness. Also be sure to maintain good air circulation around the books. In other words, don’t push the books to the back of an enclosed shelving unit. Leave some space. Don’t pack the books too tightly together. Keep the area clean and dust the books regularly. Make sure your shelves are not in direct sunlight. If possible, shelve similar sized books together so that covers don’t warp. Inspect leather-bound books for red rot. Look for fine cracks in the leather and a red powder that comes off on your hands when you touch the book. Not all leather-bound books will develop red rot. The process by which the leather was made will determine if red rot will develop. It is chemical deterioration of the leather, and it is irreversible. Deterioration can be slowed, however, by controlling the environment as described above, and by enclosing affected books in archival boxes or sleeves. Hopefully the books you bring home to add to your collection are free from pests and mold. Go through them just to be sure. And you just might find some fun things instead. 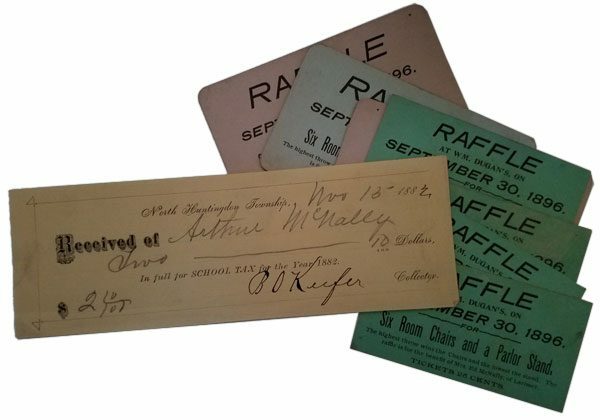 Like a receipt for $2.10 for “SCHOOL TAX for the Year 1882” and several 25¢ raffle tickets for “Six Room Chairs and a Parlor Stand” in 1896 which I found in one of my old books. Sign up below for occasional updates and notices. Your information is safe with us. We'll never sell or distribute it to anyone. Provide your email address below to join the JournalScribe family. You will receive the Sharing and Caring pdf and occasional tips on how to preserve, protect, and share your own family history. 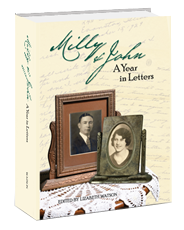 Milly & John wrote each other daily for a year, from their engagement in June 1929 until their marriage in June 1930. This book is a compilation of their letters. © 2017 JournalScribe. All Rights Reserved.